a natural light nature and landscape photographer from Kalamazoo, Michigan. Daniel has had a camera in hand since age five, though only in the past six years has he been pursuing photography seriously. Daniel loves teaching and being taught, continually striving for excellence and technical mastery both behind the camera and in the digital darkroom. Proud Photography hosts an online photography school, currently with two offered courses: Interactive Online Photography Course and The Expert Wedding Photographer. You can also read my brief review of Proud Photography here. Wix.com offers a free flash website builder that lets you design beautiful websites with no programming required. Using its highly intuitive interface you can pick a template and add or remove components to produce a unique website that lets you share your photographs with the world. Epic Edits also pulls in some residual from Google Adsense, Amazon affiliates, and various other affiliate programs. Those are helpful to fill in the empty spaces and I appreciate it when any of you pitch in through those avenues. This entry was posted in Partners and tagged advertiser, partner, photography, proud photography, sponsor, wix on May 3, 2010 by Daniel Flanagan. Design your own free photography website with Wix’s website builder, and save time and money you would have spent hiring a web designer. With Wix, no programming is needed to customize one of the brilliant Flash templates, designed specifically for photographers. Choose a free template and immediately start customizing it, without downloading anything or even confirming an e-mail registration. Wix is highly intuitive, and playing around with the design elements is a fun and even addicting process, even for those with no technical skill. The website builder’s user interface is graphic-based, and a simple drag-and-drop process allows users to customize design features. The result is a brilliantly designed, unique website that lets you share your photographs with the world. Templates – Choose a template that compliments your photographs. Each template is fully customizable – change the color, texture and layout as well as the content itself. Galleries – Showcase your photographs by arranging them with one of Wix’s many gallery styles. Each gallery style has its own unique layout, so you choose how your photos are presented. Gallery styles include matrix, slideshow and carousel formats. 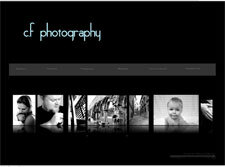 Mini Web Pages – Create a separate page for information about the photographer. Another page describes your inspiration or artistic vision. Each collection of photographs, arranged by theme, date, project, etc. can have its own gallery page. Menus – Building menus into your website creates an enjoyable browsing experience for visitors. Menus are automatically linked to your web pages – all you have to do is customize their appearance. Title your menus with the names of your galleries, your Bio page, and a Contact page. Widgets – Include a Contact Form that visitors can fill out to get in touch with you, to ask for more information about the photographer and his/her creations. Music – Add a music player widget to add an audio element to your website. Upload your own music files, and customize the On/Off switch. Social Media – Add a link to your Facebook, Twitter or MySpace account. Publish your Wix creation on a number of social networks. Another neat thing about Wix websites is that they are SEO compatible. This means that search engines such as Google and Yahoo are able to index sites created with Wix, so when someone performs a search for your photographs, your Wix site will appear in the search results. Wix’s SEOMyWix blog provides tips on how to optimize your website, to attract the most amount of traffic as possible. There are also plenty of video tutorials and helpful articles on using the various elements of the website builder, in Wix’s online Help Center. I recommend using Wix if you are new to web design but still want to achieve professional results. Websites created with Wix are completely free, with the option to upgrade to a Premium accounts for users who wish to gain control over their domain. Upgrading also allows you to insert a Shopping Cart widget onto your site, so that clients can purchase photographs or service packages directly. There are a few Premium packages from which to choose, but each one is much cheaper than hiring a professional web designer. Check out examples of photography websites made with Wix by visiting Wix.com, and clicking on “Explore” at the top of the homepage. Go to the Photography section. Or, start browsing the entire gallery of Wix photography templates by choosing “Create” from the home page, and opening the Photography category. Find a design that will illuminate your artwork, and make it yours with customized, easy and fun web design. Give your photographs the brilliant web design they deserve. This entry was posted in Partners and tagged flash, photography, portfolio, sponsor, website, wix on April 20, 2010 by Daniel Flanagan.